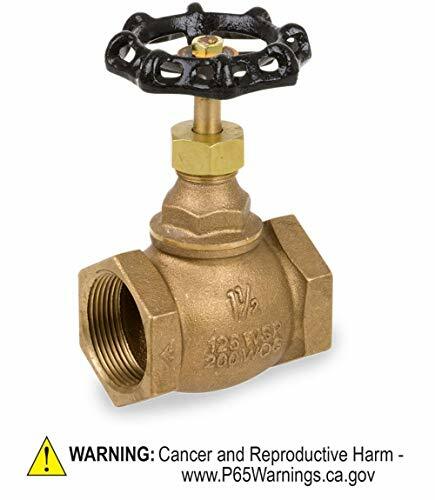 The Smith-Cooper 4101 Series inline bronze globe valve has a non-rising stem and female National Pipe Taper (NPT) threads on both ends, and is used to control flow (throttling) in a pipeline or water plumbing system. The valve body is constructed of 85-5-5-5 bronze for higher strength and corrosion resistance than brass, and its brass stem and disc provides corrosion resistance, ductility at high temperatures, and low magnetic. This valve has maximum pressure ratings of 200 pounds per square inch (gauge) (psig) for water, oil, and gas (WOG) and 125 psig for steam working pressure (SWP). The valve has female NPT threads on both ends for connecting to male pipes with tighter seals than straight threads. This valve meets standards Manufacturers Standardization Society MSS SP-80 for quality assurance. Product contains brass which does not meet federal and state requirements for drinking water.